Julie’s path to yoga started like many other yogis, feeling weak, tired, and uncomfortable in her body. She decided to try out a class at the gym, but it was not an enjoyable first experience! She decided to keep going in hopes that it would get better, and start to receive some of the benefits she had heard about. This eventually lead to becoming a certified yoga teacher through The Studio’s 21st Century Yoga on the Mat Program. As a yoga teacher, Julie wants to help you develop and advance your practice, whether that’s getting comfortable with the basics of asana, or delving deeper into the mind-body connection. 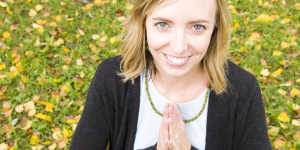 Expect Julie’s class to be grounding and centering, but also lighthearted, fun, and challenging.